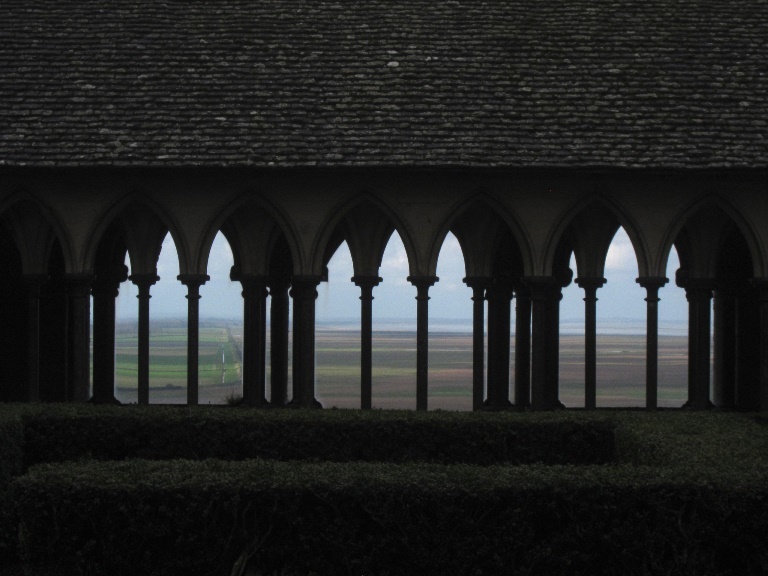 Stunning walking in and around the Bay of Mont St. Michel and to the historic abbey. This was a Walkopedia Travel Writing Competition 2011 runner up! The following is Christine Genovese's piece on walking here, which was a runner up in our 2011 Travel Writing Competition. Thank you, Christine, for bringing this walk to our attention! It's the 1st of July and I'm standing in the dunes at Bec d'Andaine looking out over the Bay of Mont St. Michel. To the east - on my left - is the innermost part of the Bay. About 20 kms to the west is the horizon, where the Bay meets the Atlantic Ocean between Granville in Normandy and Pointe du Grouin in Brittany. 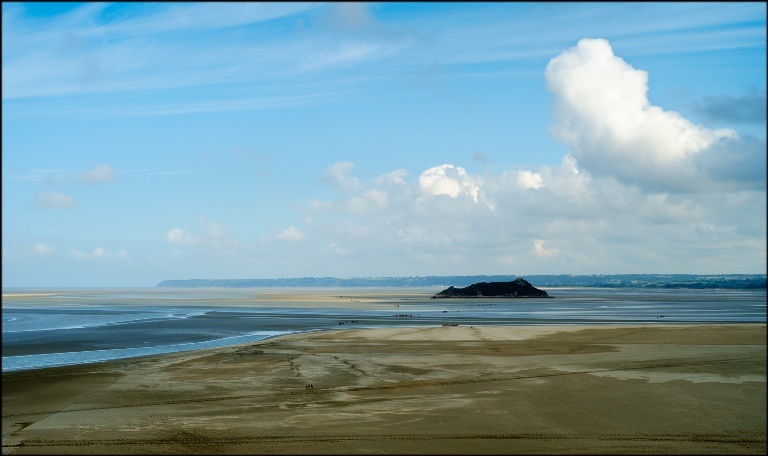 Looking south across the empty seabed, the distinctive silhouette of Mont St. Michel is clearly outlined against the blue sky. It's the destination for this day's walk. It doesn't look far - a leisurely stroll across the sands. The distance, however, is 6.5 kms and the crossing is not without an element of danger, which the Bay only reveals to those who venture close enough. The tides dictate all activities in the Bay and our walk is scheduled around today's low tide. This morning's 8 am high tide has left its marks on the beach in front of me. 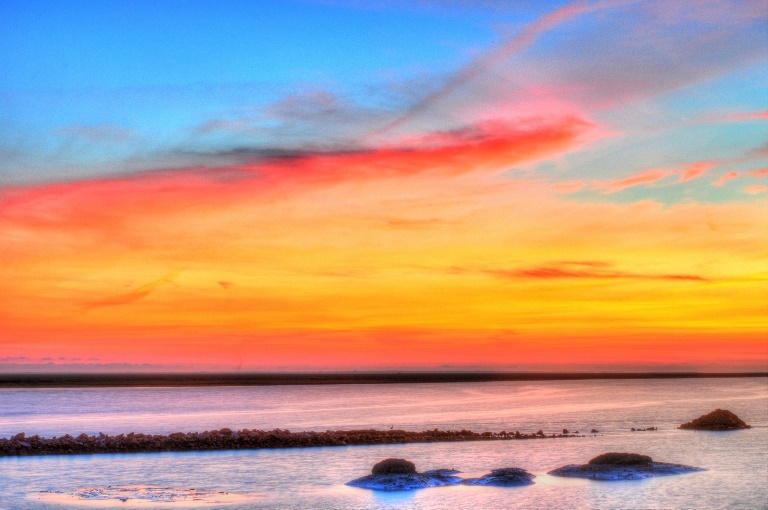 The Bay of Mont St. Michel has the highest tides in Europe. The vertical difference can reach as much as 16 metres, while the distance between the high and low tide marks can be up to 15 kms. That's a lot of water shifted in and out of the Bay in the course of 12 hours. The scenic spectacle is at its most awe-inspiring during the equinox spring tides, but even the average movement of the sea over the vast area of the Bay is impressive. Today's tide has an 88 rating. That's on the high side of a scale that ranges from 20 to 120. Our walk leaves at 11.30am, 3.5 hours after the high tide. 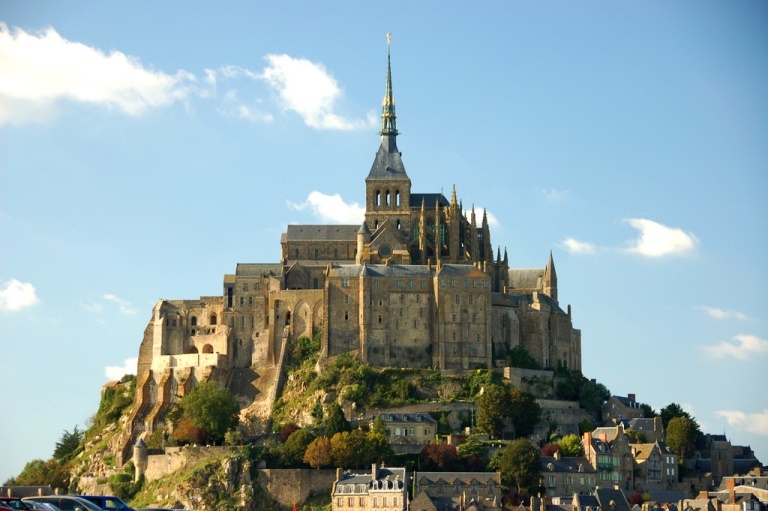 The crossing to Mont St. Michel takes 2 hours followed by an hour to explore the medieval village. Halfway through that hour, the tide will turn. We then have the 2 hour walk back and should be here by 4.30 pm. The next high tide is at 8 pm, leaving the 3.5 hour margin again. If you add it all up, you'll see that the 12 hour interlude between two high tides is carefully calculated for a safe crossing. I'm joining a group of about 30 people, led by an official guide. We wear shorts and walk barefoot. Most of us have a backpack with our sandals, bottled water and other necessities. We head off. Hopes of a walk across firm sand are quashed from the start. We're sloshing through sticky, grey silt that coats our feet and calves. Then we reach firm sand and find little pools where we rinse off the silt. V-formations of Canada geese fly overhead and the guide points out marks left in the sand by underground creatures. There are cushions of gas where vents from the depth let out the overflow. We find areas of quicksand where a foot is easily sucked down. We test it gingerly while the guide tells us the legend about the newly-weds coming home across the Bay in their horse-driven carriage after the wedding ceremony. A fiddler walks alongside the carriage playing his merry tunes. Then a fog descends and the couple, the carriage and the horses are never seen again. But, even now, many centuries later, when the Bay is in a dangerous mood, the sound of the merry fiddler playing his tunes can be heard, and people close their doors and stay in. 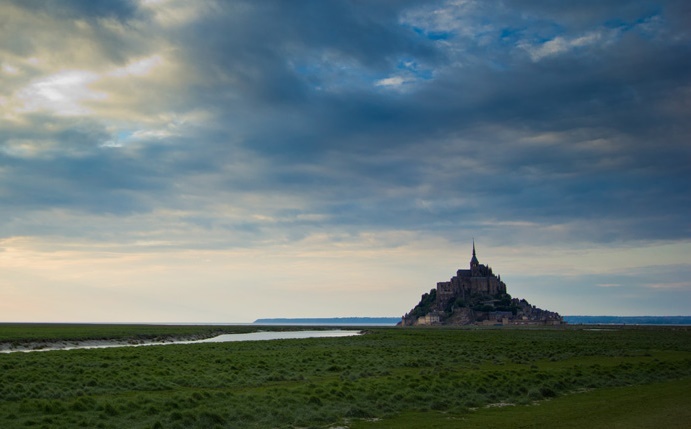 We're following the trail of many pilgrims since the Benedictines moved into Mont St. Michel in the 10th century. A well-trodden path you might say. But the sea wipes the Bay clean twice a day. The outgoing tide, assisted by the winds, subtly alters the entire seabed. Even the guides never see the same scenery twice and yet the character of the Bay has remained unchanged for thousands of years. We've been walking for over an hour across virgin sands. The coast we left is distant and Mont St. Michel seems no nearer. With the infinite sky above us and the endless sands around us, we're at the centre of the universe. It's a cosmic moment - a brief brush with eternity. We reach the first of the two rivers that flow into the Bay. It's about 10 metres wide and far from a tame trickle. We brace ourselves against the rushing current and cautiously make our way to the other side, aided by a surge of adrenaline. The seabed is no longer flat. There are humps as we approach Tombelaine, a rocky outcrop where there was once a medieval hamlet. It's now a bird sanctuary where amongst other species shelducks nest. When the tide is in seals can be seen playing there or sunning themselves on the rocks. We cross the second river, slightly more confident of our ability to cope with the elements. 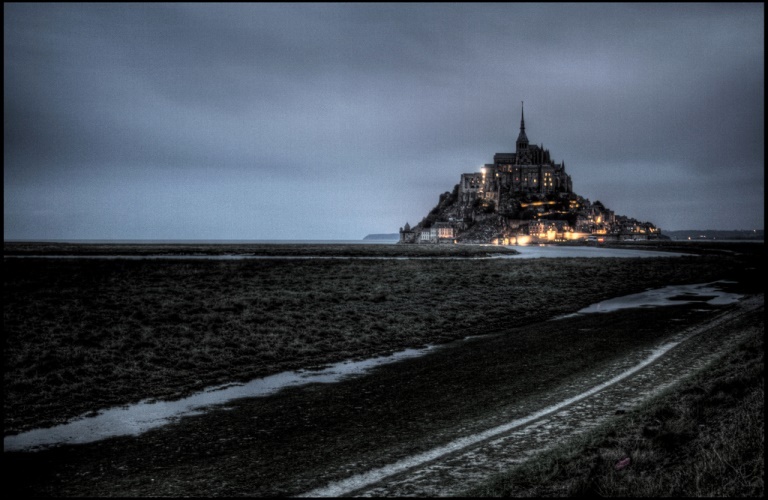 Mont St. Michel begins to come into focus. The Abbey first, then the shapes on the rock turn into quaint little houses clinging to the steep sides. The final part of the crossing is another trudge through thick, slimy silt. We arrive like shipwrecked savages in the sophisticated world of mass tourism. There's a standpipe at the entrance and we clean up as best we can before venturing into the lower realms of the Mont St. Michel village where a seething crowd of tourists battle their way through the maze of souvenir shops. I slip through the crowds and climb the narrow streets towards the Abbey where I slow down to take in the stunning view of the seabed we just crossed. There are glimpses into peaceful little private gardens and winding stairway alleys. I'm struck by the contrast between the grandeur of the Abbey and the humble medieval houses with their slate or shingle roofs. But it's time to rejoin the group for the walk back. It's a relief to leave the milling crowds behind and breathe in the sea-scented air. The wind is picking up and wisps of cloud streak the sky. As we pass Tombelaine the shrill trill of the curlew fills the air. The tide is coming in and I imagine the first fringes of water gently sliding round Tombelaine followed by the great mass of water that will fill the entire bay. According to the locals it comes in 'as fast as a galloping horse'. How soon will it reach this area? The wind makes it harder to keep our balance as we ford the rivers with water rushing up over our knees and unseen lumps and bumps underfoot. Once through we start scanning the coastline for landmarks. It was easy on the way out with Mont St. Michel beckoning us towards it. But here I fail to recognise any distinguishing features until the guide points to headlands along the coast. An intimate knowledge of the area is essential. I shudder at the thought of poor visibility, and at the sad fate of those long-ago newly-weds. We reach Bec d'Andaine as planned at about 4.30 pm after a 13 km walk done in five hours. It was an otherworldly experience out there - in the sea's rightful territory - so unlike the terra firma where we belong. 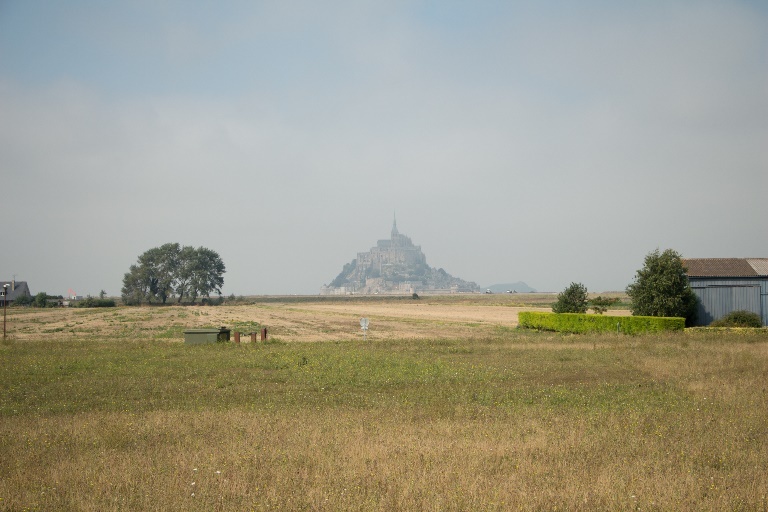 There is a newly published IGN Topo guide to the GR22 from Paris to Mont St Michel which would be an excellent long distance walk.